"I've wanted to do this flight for a long time - it has been a major ambition. 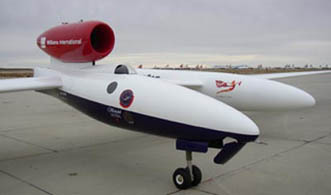 It would not have been possible without the right people being associated with the project, such as Scaled Composites, lead by Jon Karkow, (who built the plane), and Richard Branson, along with Virgin Atlantic's support, and the team here at Kansas State University including the 11 students who were integral to the project. "I am very lucky guy - I got to achieve my ambition." On landing Steve was greeted by thousands of spectators at Salina Municipal Airport, who have been avidly following his attempt for the past 67 hours. Once Steve emerged from the cockpit he was met by his wife Peggy, Sir Richard Branson, his friend and fellow adventurer, plus Jon Karkow, Chief Engineer for the Virgin Atlantic GlobalFlyer. "Although Steve must be exhausted after his epic journey he is clearly exhilarated to have set a new record. "We are all delighted that Steve has successfully achieved what can only be described as the last great aviation record remaining. I knew that if anyone could achieve this feat Steve Fossett could. It is amazing to think that since we waved Steve off on Monday his journey has taken him approximately 20,000 nautical miles (23,000 statute miles), spanned four continents - and goes to show truth is stranger than fiction!" The record achieved is the first solo non-stop circumnavigation of the world without stopping or refuelling in an aircraft, meeting the criteria of the Federation Aeronautique International (FAI). Steve has also earned records for 'Speed Around the World non-stop, non-refuelled' and 'Close Circuit Distance Without Landing. These records will be verified by the FAI and NAA over the next few weeks. A Guinness World Records official was present on arrival and has confirmed that, based on a preliminary examination of the flight data, Steve has gained yet another world record for "First non-stop solo circumnavigation of the world by an aircraft". "Everyone at Mission Control is absolutely thrilled and relieved that Steve has made it back to claim the record for the first solo non-stop circumnavigation of the world. This has been a roller-coaster of a ride but it has all been worthwhile, the team at Mission Control really deserved to see the Virgin Atlantic GlobalFlyer arrive home today. The work the whole team has put in, not only over the last 67 hours 2 minutes and 38 seconds, but the last couple of years since the project was conceived, in itself deserves a world record!" The pioneering aircraft - the world's most efficient jet plane - was designed and built by aviation legend Burt Rutan's Scaled Composites. The aircraft took off at a weight of 22,100lbs - fuel accounting for 18,100lbs of this total. The Virgin Atlantic GlobalFlyer aircraft is a single pilot, single engine turbofan aircraft and was specifically designed for this non-stop global circumnavigation. Scaled used computer aided aerodynamics to design the aircraft and the structure is made entirely from composite material and is ultra light - allowing it to fly 75% further than the previous range record for a jet-powered aircraft. 3 March 2005, Geneva, Switzerland: Scouts around the world are proud of the new records set by Steve Fossett with GlobalFlyer, which displayed the Scout emblem on the cockpit. Scouting had a special place among the sponsors' emblems because of Scouting's importance in his personal development. "Each record I set is like I have earned a new Scout badge. I was a Scout when I climbed my first mountain," Steve said. Today, Steve is an elected member of the World Scout Committee, the board of the World Scout Organization which includes more than 28-million members - girls and boys - worldwide. "Steve has demonstrated that self confidence can take one far, to continue to explore the limits of science, technological progress and human character," said Dr. Marie-Louise Correa, Chairman of the World Scout Committee. "This is more than just a new record by Steve Fossett - a former Scout, it opens new horizons in aeronautics and how we view the world." 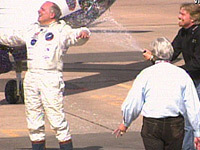 03 March 2005 - 20h00 GMT - Salina Municipal Airport, Salina, Kansas, USA: Steve Fossett has done it. Again. At approx. 1:37 pm local time (19h37 GMT) this afternoon, famed American pilot Steve Fossett returned to Salina Municipal Airport and once again flew straight into the history books, becoming the first person to achieve a solo, non-stop round the world airplane flight aboard the extraordinary single jet-engine powered Virgin Atlantic GlobalFlyer. Steve's total flight time for the almost 20 000 mile journey, which began Sunday at sunset was approximately 66 hrs and 50 mins, an average speed of nearly 300 mph. "This is a dream I've had for a long time..."
Having set numerous records and world 'firsts', Steve Fossett holds official world records in 5 sports - powered aircraft, free balloons, airships, gliders and sailing. To follow Steve Fossett and the Virgin Atlantic GlobalFlyer - and for for all the latest media information, photos, video feed, route details, tracking, background and other information available from Mission Control and the VAGF Press Center. 18:45 Central Standard Time, 28 February 2005 - Salina, Kansas, USA: At around 6:45 pm local time this evening (00:45 GMT, 1 March) record-setting pilot Steve Fossett (USA, b. 1944) powered down the 12,000' runway here at Salina Municipal Airport and took off - targeting the first ever solo, non-stop round the world airplane flight. Years of preparation and build, months of flight planning and weeks of waiting for good weather conditions are finally over as this great aerial adventure got underway. The last of some 9 tonnes of fuel was loaded in the twin-boom, glider-like jet, already positioned at the end of Runway 35. All afternoon Fossett's team carefully monitored conditions, waiting for potentially dangerous crosswinds to dissipate. Finally, shortly after sunset Fossett took the controls of the Virgin Atlantic GlobalFlyer single-engined jet aircraft, easing its deceptive 11 tonnes of bulk (with a record-setting 85+% fuel load) heading northeast into the dramatic winter twilite. The next stop, planned a little less than three days hence will also be also be Salina Municipal Airport - now some 23,000 miles away. Solo, Non-stop. Round the World. 26 February 2005: Code Green - let's go. In a typically brief e-mail to key crew, Steve Fossett advised today that take-off for his Virgin Atlantic GlobalFlyer - the first solo, non-stop round the world aircraft - is now expected this coming Monday, February 28th. Steve will be in the cockpit for the 23,000 miles+ circumnavigation which should start between 2 pm and 6 pm local time (20:00 - 00:00 GMT). "Finally both the weather and airplane preparations have come together. We are Code Green for Monday February 28. Green means that we believe that the Take Off will happen on that day. Estimated range of Take Off times is 2 PM to 6 PM. - Steve"
2 February 2005 - Steve Fossett's Virgin Atlantic GlobalFlyer launch status has reverted to CODE RED - no possible launch - through Wednesday 9th February. "Anticipation of a Launch on February 8 is less definite than on the previous forecast. While surface conditions remain good for Take Off, the Jetstream over eastern USA is now stronger. The Virgin Atlantic GlobalFlyer needs to avoid Jetstreams during the Climb to Cruise altitude due to Turbulence. Risk of turbulence diminishes at the higher altitudes. The period being considered for Launch is now stretched to the period of February 8 through 11. 30 January 2005 - Salina Kansas, USA: Record-setting pilot Steve Fossett alerted his Virgin Atlantic GlobalFlyer ground team today to be ready for a possible takeoff on Tuesday, February 8 - for the American adventurer's next extraordinary round the world flight. Constantly monitoring meteorological data for the right combination of cold, dense air and calm conditions for takeoff and initial climb to a 45,000' cruising altitude, Fossett's target in the specially constructed 114' wingspan, single-engine jet is to achieve the first ever solo, non-stop round the world airplane flight. His 23,000+ mile route will carry him near Montreal, London, Paris, Rome, Cairo, Bahrain, Karachi, Calcutta, Shanghai, Tokyo, Honolulu and Los Angeles - and is expected to take just over 3 days before landing back at Salina Municipal Airport. The carbon-composite aircraft has been standing by in Salina (with its 12,300' main runway) since Fossett made the delivery flight from Mojave, California in mid-December. Further air and ground tests and final preparations, including the installation of Fossett's Mission Control flight planning, communications and media center at the adjacent Kansas State University Salina College of Technology and Aviation, are now essentially complete apart from a final planned shakedown flight test later this coming week. The final RTW flight preparations - the loading of some 18,000 lbs of military specification jet fuel into the 13 separate fuel cells in the central fuselage, twin booms and wing structure - will wait until just prior to takeoff. 3 December 2004 - Salina, Kansas, USA: Sited in the middle of the continental United States, Salina, Kansas has been selected as the start and finish point for Steve Fossett upcoming 2005 solo, non-stop Round The World flight aboard the amazing new Virgin Atlantic GlobalFlyer, the elegant single seat, single engine airplane specially designed and built for this flight. The former United States Air Force base, now a municipal airport with a 13,000'+ main runway, will be the scene of Fossett's attempt to complete the first ever solo, non-stop circumnavigation by powered aircraft. Target flight time is 'Round The World in 80 Hours'. Ready date for the flight has been set for early January, 2005 - with the meteorological team hoping to identify favorable weather systems for an optimal launch window in either January or February. The aircraft itself has undergone extensive testing at the Mojave, California facilities of its builders, Scaled Composites, since its rollout in early 2004, with both Scaled project engineer and test pilot Jon Karkow and Steve Fossett at the controls. Flight tests have continued to prove the many specialized systems aboard this unique airplane - and at ever greater take-off weights. It is expected that Virgin Atlantic GlobalFlyer will require 9,000 - 10,000 feet for its fully laden (almost 11 tonnes all-up take-off weight) start for the Round The World flight. Steve will officially take possession of the aircraft from Scaled later in December, and will make the delivery flight to Salina Municipal Airport and adjacent Kansas State University Salina College of Technology and Aviation. Here is where mission control will be sited and where Steve's ground team (including a number of veterans of his successful 2002 First Solo Round The World Balloon flight aboard Bud Light Spirit of Freedom) are already putting together the final elements of the infrastructure to support the upcoming RTW flight. Virgin Group Chairman Sir Richard Branson is expected to follow the 3+ day flight closely - from Fossett's Citation X chase aircraft in fact - from which he will conduct video and audio interviews with Steve - to be broadcast around the world. March 10th 2004 - Mojave, California, USA: The Virgin Atlantic GlobalFlyer single-engine, very long range jet aircraft flew for the first time last Friday (March 5th). The successful first flight lasted one hour and thirty minutes. Designed and built specifically for Steve Fossett's upcoming solo, non-stop round the world flight next winter (target flight time: 80 hours), the aircraft has been under construction at Scaled Composites' Mojave facility. 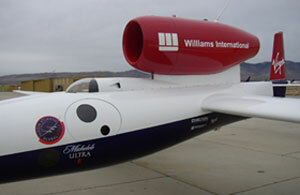 Virgin Atlantic GlobalFlyer was tested on Friday by Project Engineer and Test Pilot Jon Karkow from Scaled Composites. After liftoff, the aircraft climbed to 12,000 feet and conducted stability tests from near stall (54 Knots) up to a speed of 110knots. The tricycle landing gear was retracted and extended and the effectiveness of the airplane's descent and landing drag chutes was evaluated. Jon reported that the airplane had "excellent flying qualities". All aircraft systems operated well and the aircraft returned with no maintenance squawks. Friday's flight begins a series of test flights that should culminate in Steve Fossett's (late 2004 - early 2005) attempt to become the first pilot to circumnavigate the globe solo, non-stop, and non-refueled. "The results of this first test flight are beyond our highest expectations. It looks like we have an excellent airplane." Mojave, California, USA (January 8, 2004) - Here in the California high desert, and the home of aviation record-setting for over half a century, Virgin Atlantic today unveiled the Virgin Atlantic GlobalFlyer -- an extraordinary 114-foot wingspan, single engine jet in which Steve Fossett aims to become the first solo pilot to fly non-stop around the world later this year. The pioneering aircraft -- the world's most efficient jet plane -- has been designed and built by aviation legend Burt Rutan and Scaled Composites. Today's unveiling is the latest project milestone, following four years of design and construction and marking the beginning of an exciting final phase of development and flight-testing. "It is fantastic to see this unique experimental aircraft in all its glory," said Sir Richard Branson, chairman of Virgin Atlantic. "This has been a dream of Steve's for quite some time, and Virgin Atlantic is proud and delighted to sponsor this historic project." "I am truly impressed, almost beyond words, looking at this amazing and beautiful airplane," said Fossett. "Burt Rutan's team at Scaled have turned a dream into engineering reality. And I consider myself enormously fortunate to have as project 'patron' my friend and former ballooning partner Sir Richard Branson. Richard and Virgin Atlantic are true, record-setting pioneers and they understand what this project is all about -- setting the most ambitious goals, meeting the most extraordinary challenges." Virgin Atlantic GlobalFlyer is a single pilot, single engine turbofan aircraft specifically designed for one mission -- a non-stop global circumnavigation. Fuel load, weight and strength are paramount. The main structure is constructed entirely from advanced composite materials and the aircraft can carry more than four times its own weight in fuel -- enough to power the specially designed Williams FJ44-3 jet engine for the entire flight. At take off the plane (including fuel and pilot Fossett) will weigh 22,006 lbs. Less than 80 hours and some 23,000 miles later, it will have shed 18,000 lbs. of fuel to land near its dry weight of a little under 4,000 lbs. Virgin Atlantic GlobalFlyer will fly at altitudes up to 52,000 feet and travel at speeds in excess of 250 knots (287 mph, 463 kph). Careful flight planning, weather routing and navigation should allow the Virgin Atlantic GlobalFlyer to benefit from the high-altitude jet stream, adding speed, conserving fuel and enabling the mission to meet its target time of 80 hours. According to Fossett and Branson, the next steps in the attempt to achieve the first great aviation feat of the 21st century include flight testing by Scaled Composites test pilots, selecting a launch airport with a 12,000-foot runway, fine tuning the route and establishing a mission control site. The flight will take off from a centrally located site in the U.S. in either April or November of 2004, depending on test results and the jet stream season. Pilot Steve Fossett is well known for his record-breaking adventures in balloons, sailboats, gliders and powered aircraft. He is a pilot of exceptional breadth of experience -- from his tenacious quest to become the first person to achieve a solo balloon flight around the world (finally succeeding on his 6th attempt in 2002) to setting, with co-pilot Terry Delore, nine of the 21 Glider Open records, including the first 2,000 km Out-and-Return and the first 1,500 km Triangle flights. His achievements as a jet pilot for Cessna in a Citation X include records for U.S. Transcontinental, Australia Transcontinental, and Round-the-World Westbound non-supersonic flights. In 2002 Fossett received aviation's highest award, the Gold Medal of the Federation Aeronautique Internationale (FAI). Sir Richard Branson, who will accompany the flight in a support aircraft, sports his own history of dashing accomplishments. In addition to his spectacular successes in the music, telecommunications, and airline industries (Virgin Records, Virgin Music Group, Virgin Mobile, Virgin Atlantic Airways), Branson's taste for adventure led him in 1986 to set the record for the fastest crossing of the Atlantic Ocean in his boat Virgin Atlantic Challenger II. In 1987, the Virgin Atlantic Flyer, with Branson at the controls, became the first hot air balloon to cross the Atlantic. Branson assailed the other great oceanic challenge in 1991, crossing the Pacific Ocean from Japan to Arctic Canada, again breaking all existing records with speeds of up to 245 mph in a balloon measuring 2.6 million cubic feet. In the late 1990s, Branson and Fossett began a spirited competition to become the first to circumnavigate the globe in a balloon. They eventually joined forces but were not able to achieve the feat. In 2002 Fossett succeeded on a solo flight aboard Bud Light Spirit of Freedom. the new low-carbohydrate premium lager from Anheuser-Busch, the world's largest brewer. 23 October 2003 - London: At a press conference held at London's Science Museum this morning, Virgin Atlantic Airways announced its sponsorship of the first aircraft to enable a solo pilot to fly non-stop around the world. 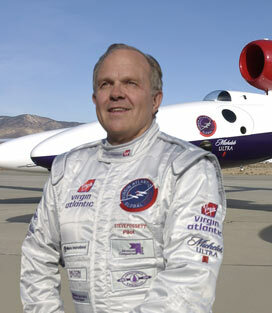 American adventurer Steve Fossett was named as Lead Pilot for the planned 2004 attempt, with Virgin Atlantic chairman Sir Richard Branson announced as First Reserve Pilot. 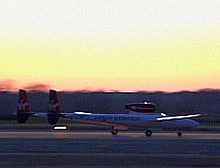 The 'First Solo NonStop' record attempt - which will also be flown without mid-air refueling - is expected to take off and return from a location in central USA in either April or October of 2004 (depending on the seasonal jet-stream of high altitude winds) and is planned to follow a northern hemisphere flight path passing near Montreal, Gander, London, Paris, Rome, Cairo, Bahrain, Karachi, Calcutta, Shanghai, Tokyo, Honolulu and Los Angeles. Target time - 80 hours. The aircraft is 38.7' (11.8 m) long and is a twin-boom design with a central nacelle and pressurised cockpit for the single pilot, with a wingspan of 114' (35 m). Designed by Burt Rutan and built by Scaled Composites in Mojave, California, USA, this single engine turbofan aircraft can carry over 18,000 lbs (8180 kgs) of fuel in seventeen separate tanks - and is specifically designed for this non-stop circumnavigation. Construction is entirely of the latest ultra lightweight composite materials for strength and efficiency. Flying at up to 52,000ft (15,850 metres), the flight should travel approximately 23,000 miles (37, 000 km) at speeds in excess of 285 mph (459 kph). The FJ44-3 ATW engine is being produced by Williams International of Walled Lake, Michigan, USA and has been specifically developed for the unique requirements of this mission. "Virgin Atlantic is delighted to launch this historic, exciting and environmentally important project. Flying an aircraft solo around the world without stopping or refuelling is the last great aviation record left inside the Earth's atmosphere. "At a time when BA is retiring the greatest achievement in aviation of the last century it is fitting that Virgin Atlantic should unveil a plane which is designed to make the first great aviation achievement of this century. Like Concorde, the Virgin Atlantic GlobalFlyer will be a sleek and slim aircraft but will be super fuel efficient - burning less fuel per mile than a Mini Cooper! "The manufacturers of the plane and the engine will generate unique data on improving future aircraft efficiency which will help develop a new generation of more fuel efficient commercial aircraft. "With this attempt Virgin Atlantic is going back to its roots. Back in the 80's when we launched Virgin Atlantic we had a limited marketing budget and by attempting (and setting!) a number of marine and aviation records we put Virgin Atlantic firmly on the map. This time round we also benefit from Steve Fossett's high profile, particularly in the US where he is recognised as the king of record breakers." "The 'First Solo NonStop' is a grand endeavour. Flying around the world has always been a great romance and adventure. To do it first by airplane - alone and non-stop - will be very special. If successful, I hope to earn a place in aviation history in the legacy of Wiley Post who was first to fly round the world solo. In July, 1933 Post made it around with eleven stops and in under 8 days. I hope to make it with no stops and in under 80 hours. "This will require all of my abilities as a pilot, it will test my endurance, and it will demonstrate the finest in lightweight aircraft construction and improvements in jet engine fuel efficiency that have never before been achieved. I am supported by a team and the technology to pull it off." Since it was founded in 1984, Virgin Atlantic Airways has become Britain's second largest carrier serving the world's major cities. Now based at both London's Gatwick and Heathrow airports, it operates long haul services to twenty two destinations world-wide as far apart as Las Vegas and Shanghai. Virgin Atlantic currently has a fleet of 27 aircraft which includes twelve 747s, ten Airbus A340-300s and five A340-600s. All of Steve Fossett's adventure challenges are supported by Michelob ULTRA, brewed by Anheuser-Busch, Inc., the world's largest brewer. Michelob ULTRA is a low-carbohydrate, low-calorie beer appealing to consumers with active lifestyles. The brand was introduced in the UK in August 2003 after being launched in the US in September 2002. Active across a broad range of adventure sports, Anheuser-Busch previously served as title sponsor for Steve Fossett's successful first solo, round-the-world balloon flight, the Bud Light Spirit of Freedom. 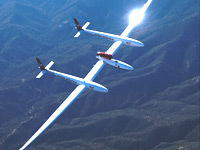 Steve Fossett and the Virgin Atlantic GlobalFlyer are also supported by Chelton Flight Systems and ACG carbon prepreg products. Note: Sadly, Steve Fossett disappeared in a borrowed aircraft in September 2007.